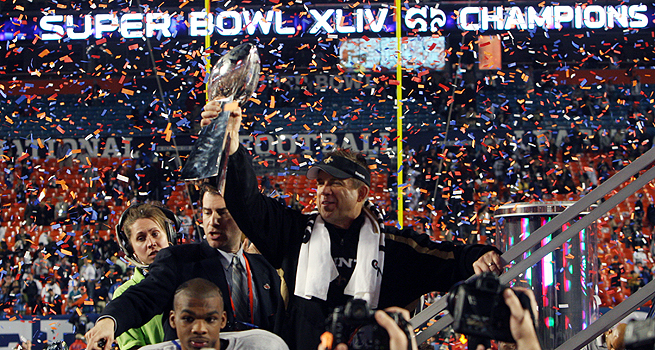 Coach Sean Payton celebrates the Saints’ triumph in Super Bowl XLIV. MIAMI GARDENS, Fla. — The ultimate underdogs, they ain’t. Not anymore. The Saints are Super Bowl champions now. Brees and the Saints rallied to upset Peyton Manning and the Indianapolis Colts 31-17 Sunday night in one of pro football’s most thrilling title games. But not something many expected from these descendants of the hapless Aints, who were five-point underdogs. A surprise onside kick sparked the Saints’ second-half comeback. Their 25th-ranked defense made several key stops, and Tracy Porter’s 74-yard interception return touchdown on a pass from Manning clinched it. Manning tried to give chase, but was blocked by Saints DE Will Smith and fell awkwardly as the cornerback raced by. The four-time NFL MVP forlornly walked to the sideline as the Big Easy celebrations began. An NFL also-ran for much of their 43 years, the Saints’ football renaissance, led by Brees and Payton, climaxed with Shockey’s touchdown and Lance Moore‘s two-point conversion catch, originally ruled incomplete but overturned on Payton’s challenge. Porter’s pick, just as dramatic as his interception of Brett Favre‘s pass to force overtime in the NFC title game, was the game’s only turnover. It’s one Manning will forever regret. The championship came 4 ½ years after Katrina ravaged New Orleans, making the Saints nomads for the 2005 season. There even was some doubt they would return, but the NFL refused to abandon the city. The Superdome was repaired and the Saints won the NFC South in ’06, their first season with Brees and Payton. That was the season Manning won his only Super Bowl. He got the Colts off to a quick start and had them in front for much of this one, but New Orleans’ league-leading offense, which scored 510 points this season, outscored Indy 31-7 after falling behind 10-0. That matched the biggest comeback in a Super Bowl. Before many of the 74,059 fans got settled following the Who’s halftime show, the Saints worked a little football voodoo. Garrett Hartley‘s onside kick was touched by the Colts’ Hank Baskett, then recovered by Chris Reis at the New Orleans’ 42. Looking like the NFL’s most potent offense, the Saints seized the opportunity to take their first lead. It came on Pierre Thomas‘ brilliant 16-yard run with a screen pass, capped by a dive into the end zone. Hartley, the hero of the NFC title game with his 40-yard field goal in OT, made a 47-yarder later in the third quarter. After Matt Stover was wide left on a 51-yarder early in the final quarter, Brees led the biggest drive in Saints history. 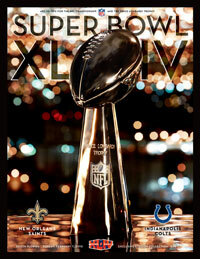 Click here to purchase the exclusive stadium collection version of the Super Bowl XLIV game program. Then Manning led a 96-yard, 11-play drive that appeared almost routine, even though it tied the longest march in a Super Bowl. Addai rushed for 53 yards on the series, and Manning found Pierre Garcon behind backup cornerback Usama Young for the 19-yard score on third down. Then Indy’s defense, ranked 18th during the season but staunch in the playoffs, really showed some power. After the Saints marched 71 yards, including 40 yards on two receptions by Marques Colston, New Orleans had third-and-goal at the 1. Mike Bell slipped trying to run right behind All-Pro guard Jahri Evans, and Thomas was stacked up at the line by Gary Brackett and Clint Session on fourth down. But the Colts ran three times and punted after getting the ball back, leaving 35 seconds for the league’s most prolific offense to get in position for Hartley’s 44-yard field goal and a more manageable 10-6 halftime deficit. I am SO proud of the Saints and the city of New Orleans and Drew Brees– they are all class acts. GEAUX SAINTS!! !